Blogs with Bite is an occasional omnivorous sampling of food blogs and sites we find particularly tasty. Follow the trail of bread crumbs back to earlier editions, starting here. Italian Innards, Snails, and Frogs — Main course recipes from the Italian Trade Commission. More conventional offerings here. What Would Jesus Eat?— Blogger Lucas Land, a graduate of Baylor’s Truett Seminary, is interning at World Hunger Relief and farming. He explores intersecting issues of food and faith, sustainability and stewardship. I Love Pickles — Website of Pickle Packers International, Inc., “a trade association for the pickled vegetable industry.” Tips and facts and recipes (including Saurkraut Chocolate Cake and Fried Dill Pickles). Farida’s Azerbaijani Cookbook — Californian blogger and cook Farida Sadikhova Buyuran is originally from Baku on the Caspian Sea, capital of Azerbaijan. 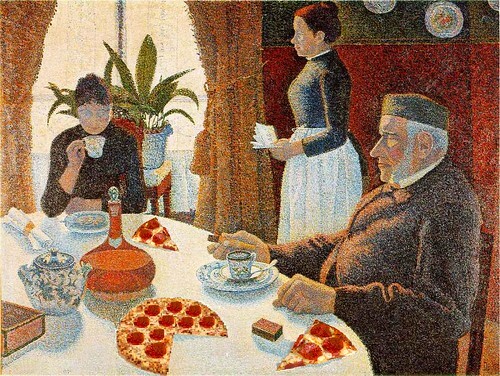 Food Poetry — Charlston’s Doug DuCap observed National Poetry Month (April 2009) on his blog, HuggingTheCoast, with a celebratory aggregation of links to 42 well-chosen works. This Is Why You’re Fat— “Where Dreams Become Heart Attacks.” Caution: do not view this blog if you take medication to control blood lipids. Still, that Deep Fried Cheeseburger On-A-Stick does look mighty tasty. 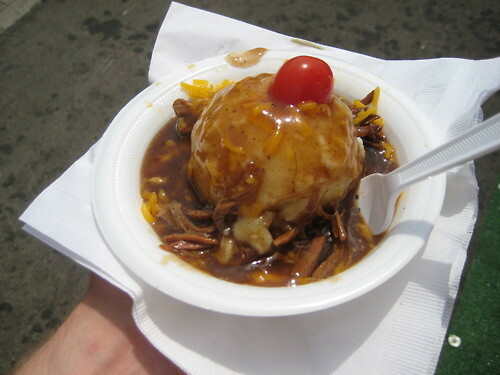 A Hot Beef Sundae for dessert, perhaps? Museum of the American Cocktail — The physical museum is located in New Orlean’s new Southern Food and Beverage Museum (SoFAB). The drinks museum has a virtual exhibit is here, but mix it up with the MOTAC blog. Read It and Eat — “A Culinary Expression of Awareness, Sensuality & Community.” Food, wine, recipes, photos, food issues, culinary culture. Vintage Tea Rooms — “In the 1920s, especially, tea rooms became the fashionable places for women to meet friends in small towns, big cities, and suburbs alike.” A refreshing site by Jan Whitaker. Shall I pour? Feast on the Cheap— “Delicious, healthy, homemade food should be easy and accessible – and shouldn’t require a massive bank account.” Recipes, and food tips from Mary Anne and Muriel Rittenhouse. Excellent advice on the well-stocked pantry. The Food Allergy & Anaphylaxis Network — Food allergy and anaphylaxis awareness, alerts, change of ingredient notices. Separate sites for kids and teens. Over 12 million Americans have food allergies, including about 1 out of every 25 kids. The FDA has a good summary. Pigtown Pigout — Visually vibrant blog by Baltimore’s Meg Fairfax Fielding. 104 Things to Do With a Banana — Recipes (sorry) by Wayne M. Hilburn. Plants.am— Plant and garden wiki-encyclopedia (6,634 entries, 10,027 photos) including vegetables, fruits, herbs and spices, spice mixtures, and edible seeds. Spam — Video (2:13) of the classic skit by Monty Python’s Flying Circus. Fruit Facts — information on tropical and subtropical fruits from the nonprofit California Rare Fruit Growers, Inc. Handy Fruit List and Fruit Cultural Data pages. Sizzling Words — Contemplative seasonal haiku collection celebrating … bratwurst. Aphrodisiac Foods — Alleged amour-enhancing edibles and recipes from Gourmet Sleuth and Aphrodisiology. Your mileage may vary. Herbal Recipes — From A Modern Herbal, by Mrs. M. Grieve (1931). This entry was posted on June 16, 2009 at 8:14 am and is filed under agriculture, cooking, cuisine, dining, food. You can follow any responses to this entry through the RSS 2.0 feed. You can leave a response, or trackback from your own site. Mariel and I are honored to be included, thanks so much Mike! Thanks so much for mentioning our food poetry post! feastonthecheap writes: Mariel [Rittenhouse] and I [Mary Anne Rittenhouse] are honored to be included, thanks so much Mike! It is a pleasure when culinary professionals use the Blogosphere as more than a billboard for their businesses and share their love of food in ways meanful to the home cook. Good food writing is even more exceptional. Hugging the Coast writes: Thanks so much for mentioning our food poetry post! We hope for another iteration commemorating Poetry Month next year. always look forward to reading this as there’s limitless talent out there waiting to be discovered. Mike, I am truly touched to have been featured in this round of Blogs with Bite. You have made my day, and I cannot express my thanks! Check out Velveeta Ain’t Food…great recipes and hilarious stories. I like TasteSpotting (great pictures) and FoodBlogs.com (a lot of blogs on one site). I found several new blogs that I never heard of on these sites. Robin: I share your admiration for TasteSpotting. Foodblogs is, appropriately enough, a “feed.” It lists the registered food blog sites, with tne most recent posts on top. This is of some use but there is no annotation or category structure, just the title and first paragraph of the most recent post on each blog. This does not make for great reading. A great concept, but eyes glaze over pretty quickly. Another issue: as of this date, over 60 registered blogs have not posted a single item. Hey! Thanks for including me in this illustrious group.